There is a new category of notebooks known as Ultrabooks – these will be small and light models, which of course, will not sacrifice performance in the name of size. The latest model from Toshiba of Japan would be the Portégé Z830 Ultrabook, where it is touted to be the lightest 13.3″ Ultrabook in the world, dipping under the 2.5 pound mark while being encased in a chassis that is no thicker than 15.9mm. Not only that, Toshiba is proud to claim that the Portégé Z830 Series is around 20% lighter and 40% thinner compared to the award-winning ultraportable Portégé R830 Series. Needless to say, with a price point that starts from under the magical $1,000 mark while delivering unprecedented portability, durability and essential features in a stylish design, Toshiba might have a winner here. Just what will be the engine of the new Portégé Z830? Well, we are looking at the second generation Intel Core processors coupled with superior speed DDR3 memory, giving all you need to get your work done without breaking your back when traveling on long distances. 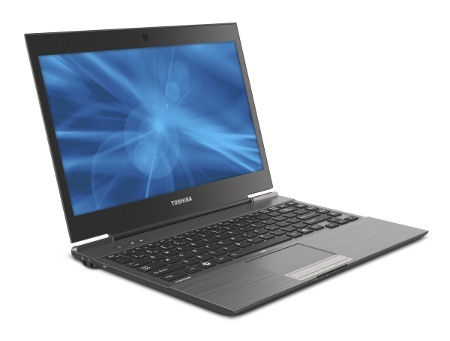 With a 128GB SSD and Toshiba’s exclusive Hi-Speed Start Technology, you can be sure that the Portégé Z830 can power on in a jiffy, helping you boot up the program of your choice within moments. Not only that, Toshiba knows that some of you out there love working in the dark – especially when it is late at night, as you tend to be more productive in that way. Well, just in case you can’t see your surroundings and knock over a glass of water, fret not – the full-size LED backlit and spill-resistant keyboard should be perfect to avoid such situations. Apart from that, you are also able to juice up your favorite devices via USB when connected to the Ultrabook thanks to Toshibas USB Sleep & Charge technology. With the inclusion of stereo speakers that have enhanced audio technology from Waves Audio, the Portégé Z830 also works great to help keep you entertained whenever you need to take a break. You might want to start saving up the for Toshiba Portégé Z830 Series Ultrabook from now on as it will arrive this coming November.